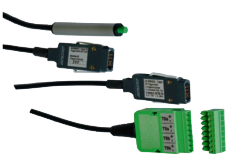 A modern measuring instrument / data logger must be able to communicate with its environment, i.e., transfer its measured data to peripheral equipment, execute commands from a computer, trigger alarm signals, and respond to switching pulses. ALMEMO measuring instrument / data logger – to choose freely from a wide variety of output interfaces to best suit the particular task at hand. For the purposes of connecting the modules, virtually all ALMEMO devices are equipped with two output sockets, A1 and A2; these also allow the devices to participate in digital networking. The output modules, just like the sensors, are detected automatically; no extra programming is required. Please note that many ALMEMO output modules can only be operated in conjunction with ALMEMO devices Version 6 and above (not 2390, 8390); labeled V6 (device firmware update may be needed).